Former governor of Abia State and chieftain of the ruling All Progressives Congress (APC), Dr. Orji Uzor Kalu, has declared that the APC deserves re-election in 2019 because the party has done well. Kalu said the President Muhammadu Buhari-led Federal Government saved Nigeria from extinction by confronting the Boko Haram insurgency and improving the security architecture of the country. “When Boko Haram was bombing churches, I told people that they will extend to mosques. If not for the way Buhari confronted Boko Haram and provided weapons for the military, Nigeria would not be here,” he noted. 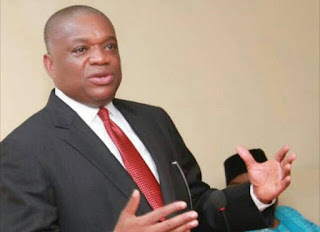 Kalu, in a statement yesterday said the APC was in a very good state and that all disagreements within the party were essential elements of democracy. “Everything happening in the ruling party is obtainable in other advanced democracies. I don’t see anything different from what is happening in the APC and what happens in other advanced democracies. In every democracy, there are disagreements and agreements after all we are not born of the same father and mother”, he said. The former governor also dismissed the possibility of the People’s Democratic Party (PDP) returning to power in 2019, and added that Nigerians should not trust the party after it looted public funds within 16 years it was in power. “PDP will find it difficult to return to power; not the party that looted public funds, it is going to be difficult. The PDP has not shown the right reason why they should return to power because going back to power means returning to power to open our Central Bank and continue the looting,” he added. Kalu specifically accused former President Olusegun Obasanjo and his friends in the PDP of sharing $16 billion earmarked for power projects between 1999 and 2007.